Saving the World One Nail at a Time: Let's Go Yankees! Yesterday I went to the subway series Yanks vs. Mets game at Yankee Stadium! It was a lot of fun. Of course I had to support my team on my nails! 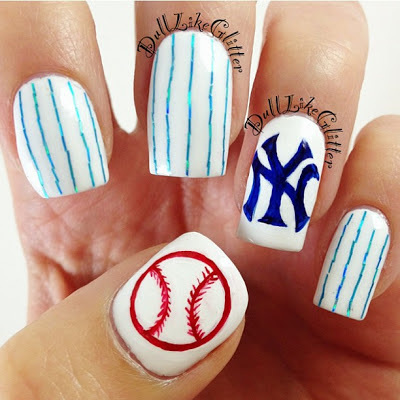 I guess my nail art didn't help much because the Yankees got slaughtered! I created these nails using Zoya Purity for the base, hand painting the logo and baseball on and did the pinstripes by placing individual blue holographic bar glitters in lines.